Quote pictures or images are popular on social media. In particular, Facebook, Instagram, Pinterest, Twitter and, believe it or not, even LinkedIn. Why Are Quote Pictures So Likeable And Shareable On Social Media? One reason quote pictures are so likable and shareable on social media may be that they are easy to view and process. Quote pictures often contain concise nuggets of wisdom, inspiration, or humour that we can readily agree with or like, or not, with very little effort. In an era where, at least in the west, we are bombarded with information, finding content that is easy to process visually and aligns with our beliefs or dreams is a welcome break. It’s also easy to like and share with others in our network with a simple tap or click of a mouse. Of course, that doesn’t mean that our focus should be solely on sharing quote pictures. But, to not do so when people clearly enjoy and like them doesn’t make sense either. When it comes to social media, taking advantage of the various content options available allows us to reach a broader audience. The more varied yet relevant ways we can find to share our message in a way that has value to our target audience the more opportunity for us to impact and build influence with those we want to do business with. For businesses active on social media, any type of good quality branded content has the potential to grow awareness of our brand. Shareable quote pictures or images are no exception. How Easy Or Difficult Is It To Create Quote Pictures? Creating quote pictures may feel like a daunting task but it needn’t be. The key is to get the process in place for creating your content, and then to regularly create and share them on social media. Today it’s possible for anyone to create good quality quote images for sharing on social media. There are numerous online tools where anyone can create quote pictures, branded ideally. Software and apps are available that allow you to do this from your desktop or mobile device. Most of these tools for creating quote pictures offer a free version. More on that in a moment. For this post, the focus is on creating pictures or images similar to those in the samples above, with quotes, tips or other snippets of text, along with a high-quality photo, image or background, and your unique branding. The first thing you’ll need to decide on is what quote(s), tip(s) or other snippets of text you will put on the shareable picture(s) you are creating. Think less is more when deciding on what to share. You want the text to be large enough to read and short enough to be digestible almost at a glance. If you share your quote pictures on Facebook and plan to pay to boost them, to increase the number of people who see them, there are specific guidelines you need to be aware of. Click here to learn about Facebook’s guidelines for using text on images. Do you have thoughts, tips or quotes of your own already lined up to share? If so, jump down to “#2. Finding FREE High-Quality Stock Images” … or keep reading for tips you can use to build up your library of thoughts, tips, and quotes for future reference. Start off by deciding where you’re going to capture all the great thoughts, tips and quotes you’d like to share. An online tool like Word in Google Docs or Evernote to capture what you find? A desktop tool like Word or Pages to capture what you find on your laptop or computer? Decide on the format for capturing quotes, sayings, and tips that will work best for you. A way that is easy for you to access and add to, and also easy to copy and paste from when you’re putting together your images. The goal is to create a library of quotes, thoughts and/or tips that you’d like to share online, and that is easy to add to when you find something new. Be sure to capture the author’s name along you can include their name at the end of the quote, saying or tip, to ensure proper attribution. Use Google, Bing or Yahoo to search for quotes using the theme or keyword(s) you’d like quotes for. For instance, ‘quotes about inspiration’ or ‘inspirational quotes.’ Usually these searches will generate a list of websites that carry quotes as well as a visual gallery of quotes produced by others. Scan through the search results to find quotes that will work for your goals and target audience. Capture any quotes you’d like to use in your preferred online or desktop format, for easy access when you are ready to create your pictures or images. Writing them out is also an option, although more labour intensive. Also, capture the quote author’s name where available so you can include their name on the quote image. Double-check any quotes used. Don’t assume that because someone says ‘so and so said it,’ that they did. If there is any doubt at all, do a deeper search to ensure that the quote and attribution are correct. Articles and books can provide interesting one-liners for using as quotes that may not have been captured by others, yet. When reading ANYTHING be alert to sentences that may work well as quotes. Highlight each quote as you read it, for recording once you’re done. Or, capture it immediately by adding it to your list of quotes stored online, on your desktop or hand written. Whatever works best for you. Capture the name of the person who should receive credit for the quote, so you can include their name at the end of the quote, for correct attribution. Most of us have some wisdom or various tips inside of us that may be interesting/valuable to others. In particular, to our target audience. From time-to-time, or when we set time aside to let it percolate, these insights and tips bubble up to the surface and we can then capture them for sharing. This includes tips, inspiration or words of wisdom that would fit nicely on an image for sharing on social media. High-quality free stock images are now readily available online. For more on using free stock images – and whether you should – check out this article. Different high-quality photo or image for each picture quote. Background colour or image that is associated with your brand. Background with some design elements that may differ for each picture quote. At the time of writing, you can easily find free stock photos and images for personal or commercial use. Always check the photo licensing before downloading as some free photos have restrictions. For more on using free stock photos for your business click here. And there are many more sites out there! This article was just sent to me recently and provides ‘The 27 Best Free Stock Photo Sites’. It’s worth checking out the information they provide. Are they high-quality professional-looking photos (sharp, not blurry; good, not poor lighting)? Will they work well with text overtop the images (with a background for the text or without)? If they include people – particularly children – do you have written permission to use the images in a public manner? Not everyone (in fact, most people, unless you’re a graphic designer) knows how to use Photoshop and/or InDesign to create quality images with text overlaid for use on the Internet, or in marketing materials. However, there are a number of free online tools that make it relatively easy for anyone to put together images (photos, illustrations, backgrounds, etc.) with text for sharing on social media. Some online tools are basic and easy to figure out. Their options are limited but they do the trick … add text to images that you can then download as graphics for sharing. One online tool for those who are just getting started is Quozio. With Quozio you enter your text, then choose a background from selections they provide. Sprout Social’s article 36 Free Tools for Creating Unique Images provides a list of basic and more advanced image creation tools, for all kinds of image design projects. Buffer’s article 14 Great Tools to Create Engaging Infographics and Images For Your Social Media Posts provides good information on this topic as well. Canva is the tool I recommend to clients looking for a relatively easy online design tool. 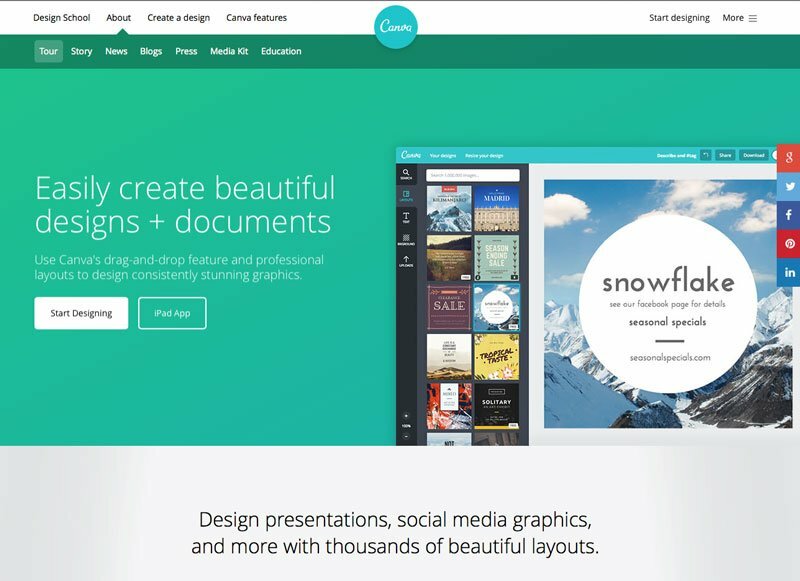 Launched in 2013, Canva makes it easy for anyone to create image designs, like quote pictures, blog graphics, social media cover images, flyers, posters, invitations and more, for FREE using their online platform. It also has paid plans with more features. Canva makes it easy to create graphics for use online and even for print. The options may make it seem a bit more complicated initially, but it is actually very straight forward, once you get the hang of it. Taking some time to play around with Canva will leave you feeling quite comfortable with the software. It is essentially drag and drop! The best way to see what Canva is all about is to take it for a test drive. This online tool can be of huge value to solo entrepreneurs and small business owners. Larger ones too! Canva also provides different sized templates for you to work with for the different social networks. Adding your branding to an image you will share on social media – whether a website address, a logo or your social media handle – helps build awareness of your brand. You’ll see this on the quote pictures at the top of this article. Keep your branding subtle but easy to see. If it’s too big it will often discourage sharing. Make sure your branding is also high quality … not blurry, difficult to read, whether you are using a logo or text. Remember, what you share and the quality of what you share says something about the quality of your business. Use fonts and colours, photos or backgrounds, and quotes, tips or sayings that fit with your brand’s personality and values. One of the other reasons to check out Canva is the training resources they provide for wannabe designers, solo entrepreneurs, keen staff, etc. Their training tutorials cover a wide range of topics, including how to use fonts, colours, images, backgrounds, shapes and icons, layouts, branding and more. They are a serious resource for anyone wanting to learn – and the resources are FREE. While Canva itself is free for a basic plan, one can upgrade to get additional options. That said, the free plan is pretty skookum. If you have a Facebook Page, spending money to promote your branded quotes to a broader audience on Facebook can be a smart decision. However, Facebook doesn’t like images with a lot of text on them. They will limit the reach of what you are boosting, or not show it at all if you don’t pay attention to their guidelines. Read Facebook Boosted Posts: How Much Text Can You Use On Images? to learn more about their guidelines.